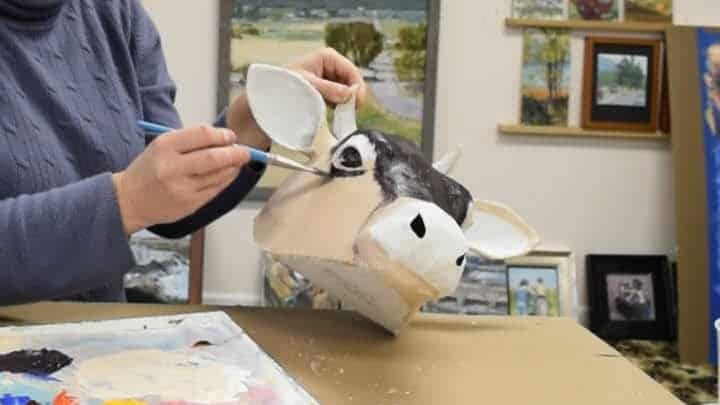 Click here to see the armature pattern that was used to make Jessie’s jersey cow sculpture. If you’d rather read or skim the text instead of watching the video, the transcript is below. I’ve never done this before, so let me know in the comments if you think the transcript is useful. Hi, I’m Jessie Rasche, and I am doing a guest post today for my mom, Jonni Good. 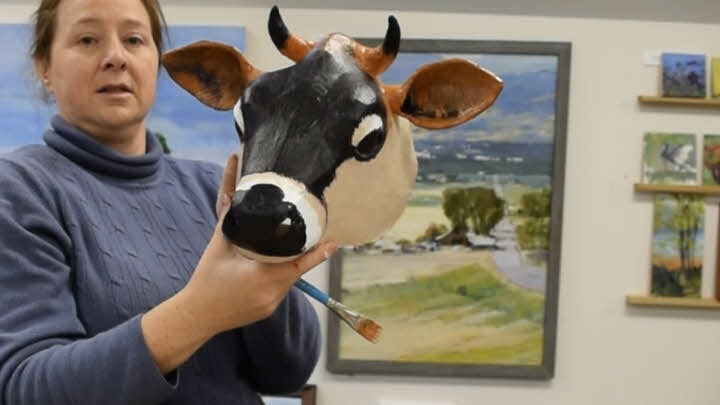 The first step on this beautiful cow will be adding plain white acrylic gesso. I’ve watered it down a teeny bit so it flows better. Putting it on pretty thick to add the paintbrush texture. I think it will look like hair in the next step. I’m going to mix up a tan color. For this first color I have a lot of white, a blob of cadmium yellow, a little bit of ultramarine goes a long ways, so I just used what was on my knife from scooping it, and just a tiny touch of the cadmium red. I’ll mix these up and see how they go. It was a little too yellow, so I mixed in some more red and a little bit of alizarin crimson. I always spend a lot of time with my mixing. This color is for her cheeks and her chin. It’s a pretty color. It’s this nice, warm, tan color. And it doesn’t hurt anything if your color is a little bit warmer or cooler, a little bit yellower. Jersey cows come in all different colors. With that darker brown, we’ll come right over this, but we’ll mix it in and it’ll be really pretty. Having the gesso still wet is helping because some of the gesso is pulling down to make hair. If I had this over to do again, I would not let the gesso dry quite so much because it’s … In the couple spots where it’s wet, it’s really neat. I’m going to quickly mix up the next color while this is still wet, and also leave some of this on my palette and keep it wet in case I need to work it back in. I’m adding quite a bit of water to it to make sure it stays juicy. The palette knife is really useful for saving paint. I’m scooting it all into a nice little pile so it stays wet longer. I’m going to mix up the darker color that’s on her forehead. It’s basically just a burnt umber, so if you don’t enjoy mixing paint like I do, then there is no harm in getting a burnt umber acrylic paint. I’m using some ultramarine blue, some cadmium red, but yeah, I love mixing up paints, so I always just start with the primaries. I think that’s pretty close. I’m going to mix in a little bit of a alizarin crimson. I want this to be a really nice warm brown. So I’m using this brush again. 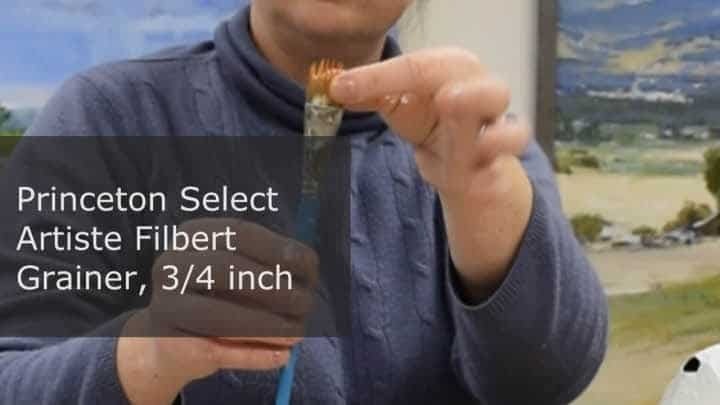 It’s called a Princeton Select Filbert Grainer 3/4″ (amazon.com link) and it has these short hairs in the middle and then longer hairs that come out, and it’s been making really nice hair texture. I’m just kind of flicking the filbert grainer brush down at the ends. See, it’s making this really nice hair texture. Her forehead hair will come down over this dark color, but I want to give it something dark to come over. 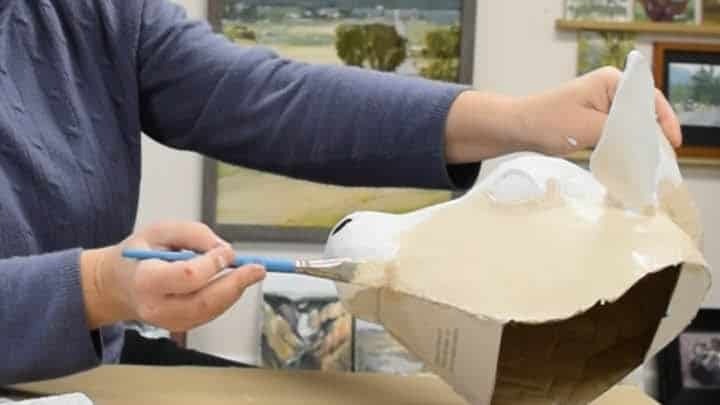 To bring out the shape of her muzzle I’m just a very lightly tapping the brush around the edge so it doesn’t leave too dark of marks. I want it to just hint at the hair, just kind of tap, tap, tap to make some detailing in the fur under her eyes. These aren’t all eyelashes. Some of it is just the dark fur right under her eye, so I’m trying to make it soft and subtle. 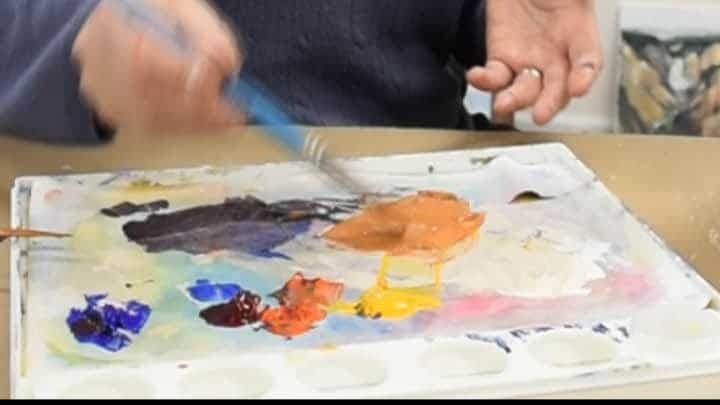 You’ve probably noticed if you’ve been using acrylic paint for a while, the more water you mix in, the more the paint will change color after you’ve put it on. So if you mix a lot of water and it might look kind of lightened, but then it’ll darken up quite a bit once it dries. Now, Jonni put this nice line right between the cow’s upper and lower lip, and I’m going to follow along with that. So this side of this brush is making a nice straight line, and it sort of unintentionally made this shape, which I think is great, and I’m going to follow along and give her just a teeny bit of a smile. It’s very subtle, but it’s right in there as this tiniest smile, and then we’ll come on back with a little bit lighter paint on the bridge of her nose. Next I’ll do the horns, and just the tips for these ones, and then it’ll be the lighter color coming up. 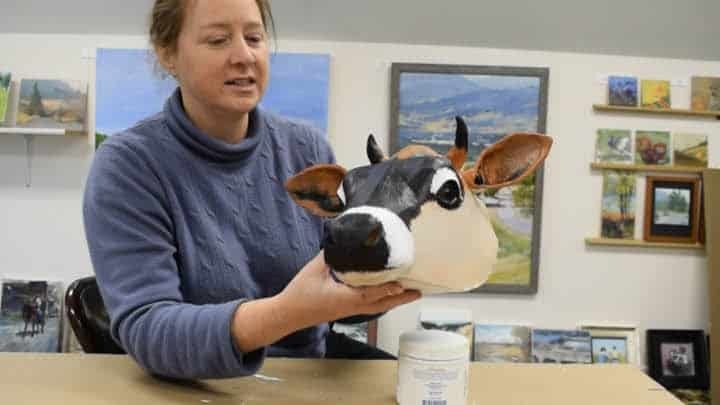 I looked at a whole bunch of Jersey cow pictures, and it seemed like some of them had horns that were black all the way down and some of them were just black at the tips and then had more of a cream or brown color below. I’m doing little circle-y motions to push the paint down and get a nice soft texture at the bottom. I’ll add a little bit of dark paint for the ears. I’m going to add a teeny bit more cadmium red to warm it up since these are the … You know, sometimes cow’s ears look really pink. This is all going to be hidden, so again, it’s just giving something for the hairs to contrast with. I’m going to do the sort of warmer brown for her forehead and her ears, and then do the really light color on the bridge of her forehead and her eyebrows very last. And the palette’s keeping these colors nice and wet. 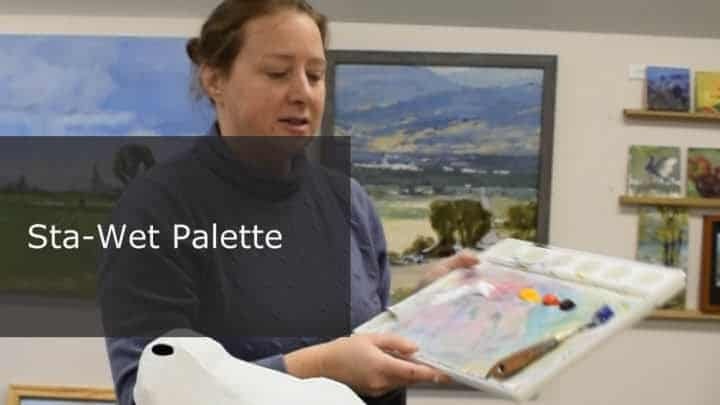 If you don’t have one of these palettes like this, put some saran wrap over the colors you’re not using. For this medium brown color, I’m starting with cadmium red and cadmium yellow. I’m just going to add a little bit of the burnt umber type color that we mixed up, our dark brown, and a little bit of our cream. See where it goes. I just mixed that into a little bit so I can see if I like it or not. It’s a nice warm medium brown, like a terracotta type color, and so I’m mixing in a teeny bit more of the dark brown. I mix in the water after I mix the color since it will change it quite a bit, but then it’ll dry more like what it looked like before I added the water. With the ears, their ears are so cute and furry, so I’m going to start with just a little bit right in here, and kind of brush upward to get that hair texture. I’m going to bring some hair up and some hair down, and get all the way around the outside. I’m going to bring it out just a teeny bit on the other side, too. 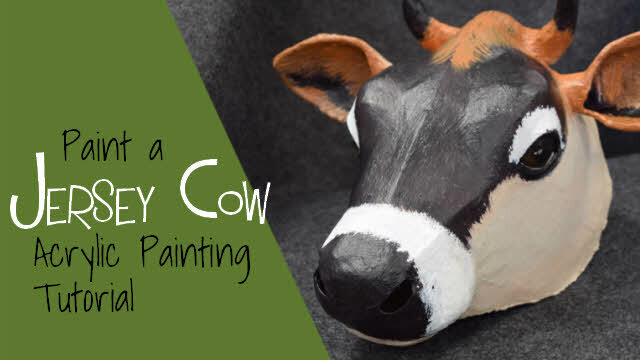 Jersey cows come in all different colors, so if you mix up your colors differently, you know, just have fun with it. Can’t go wrong. Her ears have all this texture on them now and some texture on the back. 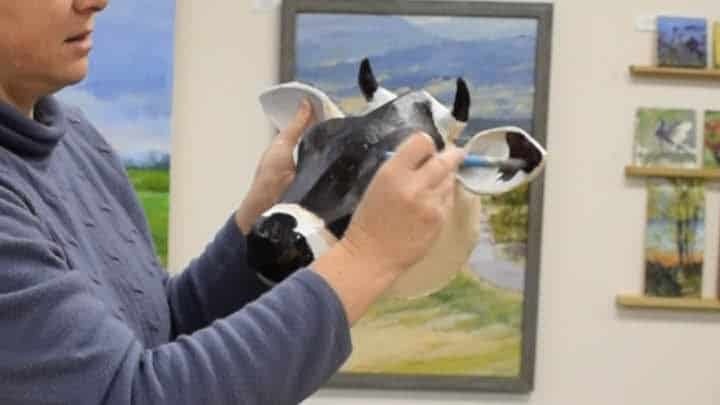 And I should say, I just love all of my mom’s sculptures, but I’m particularly partial to cows. So this is so fun getting to paint this up. I like this orange color quite a bit. I’m going to stick with it. And again, this is … You could buy this as a medium brown or a terracotta brown already mixed up or a burnt sienna, but I like mixing it with just cadmium yellow and cadmium red and just a teeny touch of blue. I’m going to keep this dark undercoat coming through a little bit, so I’m just lightly brushing down, and you can see here it’s already developing. These are going to be the final hairs, so I’m being really careful here. If I didn’t have a brush like this, I’d probably put on the big parts of it and then just get a tiny little pointy brush or liner brush to paint the hairs on individually. I’m making sure that the places where my different colors meet, that hair texture’s coming through, and I think that’ll make it feel like there’s hair everywhere without having to paint hair everywhere. I’m using one of my super ratty brushes, and because it’s been used and abused so much, the hairs are all out a bit and I think it’ll make a nice texture for the eyebrow area, where I just want it to be a little bit more subtle, and then I’ll use this other brush that you’ve seen a lot of for any hair that I want to mix. I paint a lot. I paint every day, so I have a giant tub of white, make sure not to contaminate it. Think I’m going to start with pure white, and if that seems like too much, then I might mix a little bit of our cream color into it. I’m just doing like a tap, tap, tap to get a nice soft color, and I’m going to leave a teeny bit of the colors underneath to give it a little bit of texture, and all these crazy hairs are putting a little bit of hair texture and a little bit of just kind of a softness. It’s putting a really nice texture on there. It’s kind of random. It looks like really short fur. And I’m just creeping up on where I want it to go kind of slowly so I have a little bit more control. I’m leaving that smile there, but just a little bit. I’m covering it up a teeny bit, but I want it to be in there kind of subtly. Okay. I’m leaving my white paint really thick. I’m just putting in enough water to make it move. I’m leaving a little hint of eyelashes in there. Okay. She’s down to finishing touches. I’m going to use a little bit of black. It’s ivory black. I don’t use it very often. I don’t use it to darken colors or anything like that, but sometimes if I just really want something to pop, I’ll use it. So I’m going to take a little bit of ivory black and just start with the eyes, and see if I need to mix in some other colors to kind of warm up the black a little bit. Nope. That’s going to work just great, just plain black. I’m just doing right around her eye liner area, and I’m going to give her a giant pupil. Then I’m going to go next to it with dark brown, but a really warm brown, with some ultramarine blue, some cadmium red, a little bit of yellow. So you can see that I go through a lot of paint when I paint things, and part of that is because I have been painting with oil paint for so long, I really like it when my paint stays wet and I can mix them together, and part of it is because I paint so much that my paints don’t get wasted, and I have this nice palette that’ll keep them wet for next time. 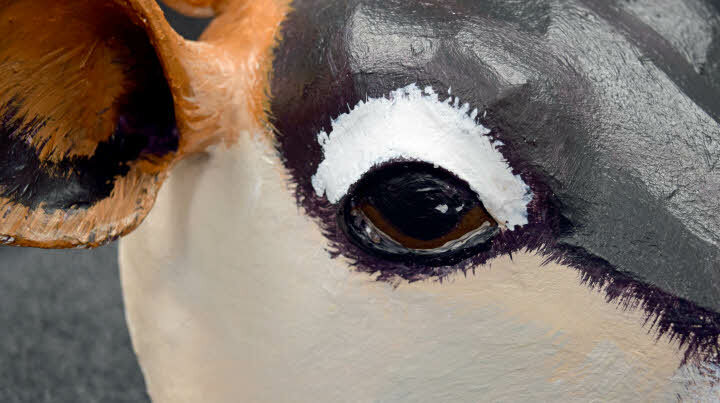 So we can give her some nice brown eyes, and you know, eyes aren’t … They might be perfect in real life, but when you paint eyes, they really don’t have to be perfect to look right. And then just a teeny bit of the beige color, darken that up a little bit and do a little bit of a line of the white underneath. The more kind of wobbly it is, the more she’ll look like her eyes are a little bit wet, and we could give her a little eye spot. I came back with the black and used up the rest that I had on my palette and just put a little bit of hair through here to give it a little bit more texture, and I used a little bit more of the dark to give some little chin hairs and some subtlety right there. And be sure to leave a comment for Jessie below – and also, tell me if you found the video transcript and screen shots helpful. I don’t know whether you can get UK tv programmes over in the US but I’ve just watched a fab programme called ‘Secret Life of Farm Animals ‘ on BBC 4 this evening. It should be available on the BBC iplayer ap. 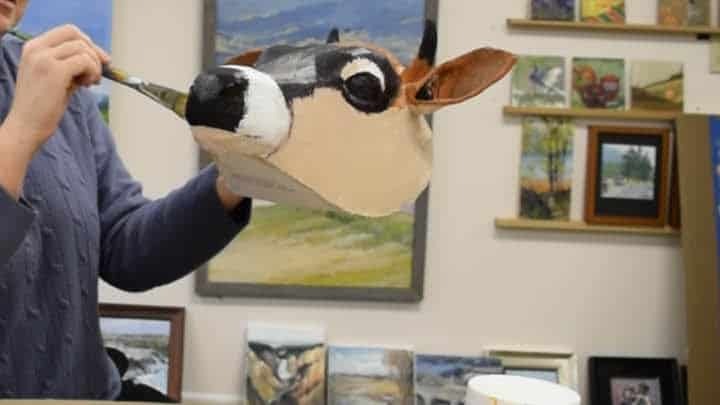 It is a slightly whimsical documentary about various farm animals..and tonight’s episode was on Cows and their behaviour..really interesting and the close up images of the creatures as they snuffled up to the camera kept reminding me of Jessie’s painting of the Cow mask! Worth a watch if you have time I suggest.. I would love to see those cows! The whole series sounds interesting, in fact. The BBC blocks some of their programs for people outside the UK, but maybe they’ll let us take a peek. Thanks for telling us about it. Love the alternative to watching the video. Sometimes I just don’t feel like watching an entire video, especially when I want to follow a tutorial as I’m working on a piece ? I also love the work you do! Have been lurking for several months, first comment, and have watched several of your YouTube videos. The writing, producing beautiful art & great educational videos you’re putting out gives me great hope for myself. The last thing I want to be doing when I’m considered a ‘senior’ is being forced to work at Walmart to support myself. It may work for some people, but it’s not something for me. I’d much rather be working with my art at that stage in my life. It’s calming & keeps the brain, the learning process, and creativity, constantly flowing. Thank you again & thanks very much for all of the inspirational posts & videos you produce! ?? Thanks for the feedback. Do you sell your artwork now? Do you have a website? Not as of yet…. I’m slowly working towards that point ? Which is why I was so happy to find a website & videos such as yours! At the moment, I am putting together a mixed-media type of project that I’m hoping to turn into a lighting piece. It’s my winter-weekend project ? But I do formulate, independently produce & sell herbal products designed specifically for chronic pain on a very small scale. Love wild herb picking as well ? I’m moving into my 50s & think I’d like to be doing a blend of both things I love so much. Thanks again & I hope you enjoy your day ? 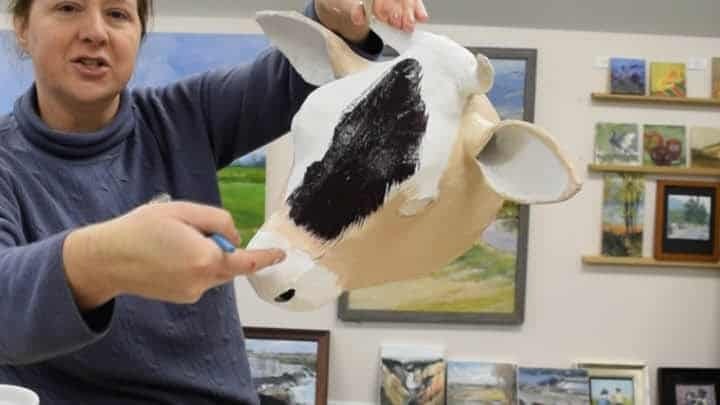 So appreciated the tutorial on painting the cow head. They are special animals …their eyes especially are glorious. Thanks so much jessie. Look forward to visiting your website. 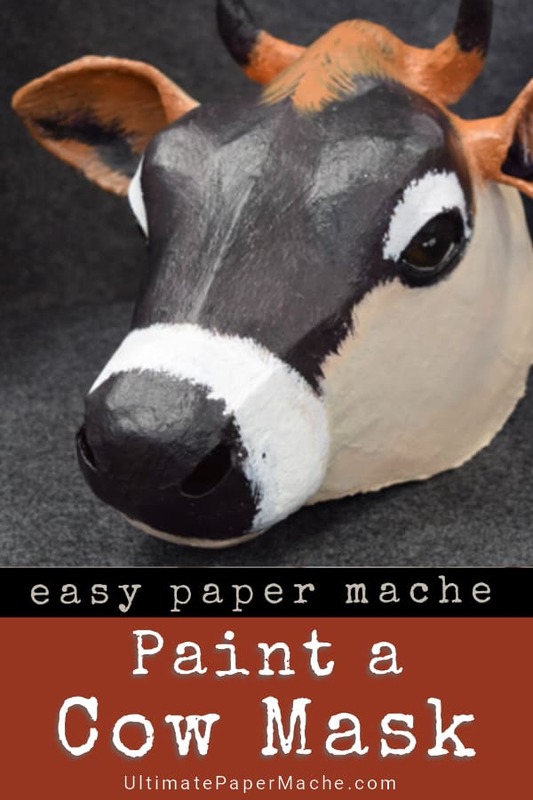 I would love to see more paper mache painting videos by you. I think you and your mother compliment the talent that you both have. Fantastic. I would love to sit in Jessie’s studio (and I promise to be quiet except for the occasional gasp). I learned many things while watching this video, and thank her for sharing her knowledge and passion. 95 percent of my painting is done using 9 colors, and it looks like I could eliminate two of them using her methods. If I listed everything she taught me, this post would be way too long, but I never understood how water affects the final drying lightness or darkness of a paint. The transcript was helpful to me because (1) I am hard of hearing and don’t always hear correctly and I can check the “facts” with the transcript and also (2) to check the colors used in mixing and the techniques. Seems like a lot of work though. And the transcript wasn’t nearly as hard as it could be – I had it done by rev.com. It would have taken me hours to do myself. It costs money, of course, but I’d like to go back over some of my own video posts and add the transcript. I often scroll right by a video on a post I visit if the same info is printed below, especially when I’m in a hurry. I might do a few of the older posts each month, as budget allows. Thanks so much for the nice comments, Rex! I really appreciate it! Beautifully done. ..such a steady hand for the detailing. The whole video is very inspiring. Thanks for taking the time to share your process with us, much appreciated. ?? Very useful tutorial! 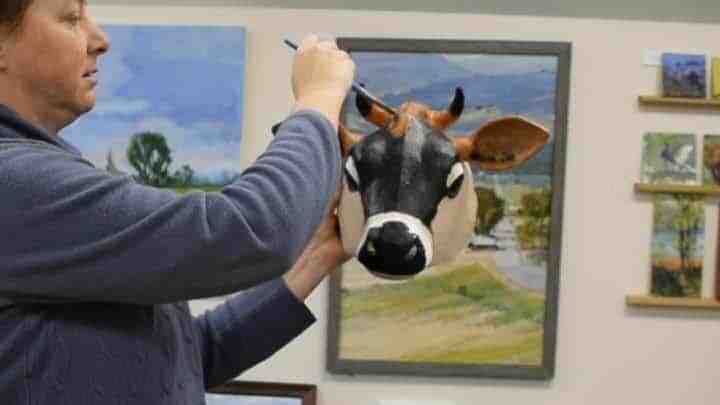 I covet that brush and will have to ask Santa to bring one! The transcript can be useful for really studying the content instead of watching a video and pausing it so you can jot down details. Jessie is such a talented gal! Thank her for doing this great tutorial for us and tell her we wish her the best on her next show! Another very talented person in the family. Thank you for sharing that. I ‘m not sure if I already posted this.It just went away. Very very talented. Thanks, Debra. I’ll pass your comments on to Jessie. I know she appreciates all the support she’s getting, and maybe it will even encourage her to make more videos. YES, I think the transcript is useful. I have very limited internet and cannot watch videos often so it is nice to be able to read the info and look at the photo of a project. It is a wonderful paint job and instructions. Thank you! Thanks for the compliment, Joni! It is a super cute cow. 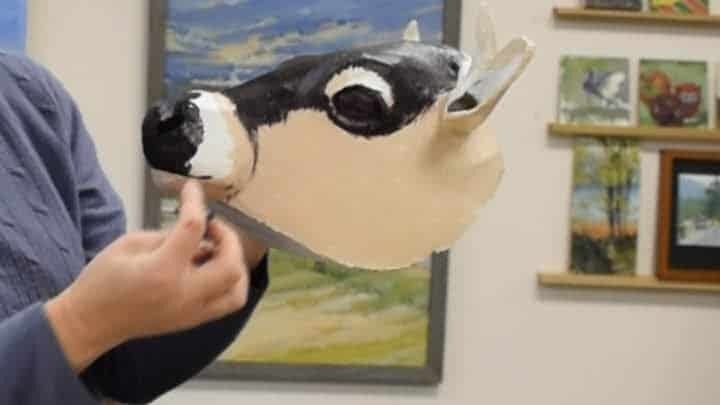 It was really fun to get to work with that sculpture mask. Thank you so much for you both sharing your time and expertise with us! I love the transcript. Do not always have the time to watch a video, but can skim over a transcript quickly looking for whatever I might be able to use on a project. You two are the best! I have to agree about the transcript – I really enjoyed seeing that, too! Jonni does such an amazing job with this blog! Beautifully done, Jessie!! Your explanations are clear and concise and very helpful. You surely do lovely work. Thank you. This was so great! I LOVE Jessie’s work and I really appreciate the tips! I am really excited about the pallet especially for my own use. Thank for such a nice presentation. It is so inspiring! That pallet was a game-changer for me. Love the video of your daughter Jessie. And her landscapes are incredible. Thanks so much Allan! I really appreciate that!